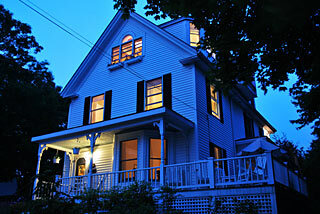 Rates range from $155-$240 plus tax per room. All rooms have private baths. One room offers a Greek tub, another a beautiful whirlpool for two. Some rooms offer picturesque harbor views and/or private balconies. 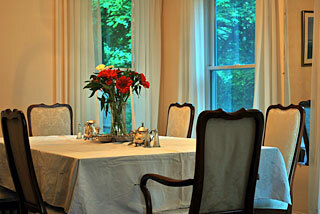 A Guest cottage is available for those desiring a more private setting. Rates pertain to single and double occupancy. 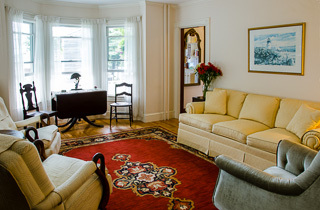 Occupancy is limited to two people per room. To confirm a reservation for one night, full payment is requested in advance, and with longer stays 50% of the lodging fee is requested as a deposit. The balance is due upon arrival. Please also note that sometimes when 3 or more rooms are reserved for several days, payment in full is requested one month prior to arrival. If your plans change after making your reservation, a 14-day notice is required in advance of arrival to obtain a refund of your deposit, less a 10% cancellation fee. Cancellations must be received by phone. The Inn must be notified 14 days prior to your arrival date (336 hours) else you will be responsible for the total cost of your reservation. The cancellation policy also applies to changes in your arrival/departure date which results in a shorter stay, and no refunds are provided for late arrivals or early departures. For longer stays and/or in the case of multiple rooms rented, we may ask for a one-month cancellation notice and payment in full one month prior to arrival. Check in between 3 pm and 7 pm, or by special arrangement.